Francisco Castillo earned his M.M. in oboe performance from the University of Southern California and a Bachelor and Licenciatura in oboe, composition and orchestra conducting from the University of Costa Rica. He was the winner of the Costa Rica National prize in composition, 1979, for his orchestral work, TUPACK AMARU. In 1988 the Los Angeles Philharmonic Woodwind Quintet premiered his Woodwind Quintet, Op.22, No.1. The Pasadena Pops Orchestra premiered his Concerto for Pasadena, a concerto for full orchestra, commissioned by the Pasadena Arts Council. Other works premiered by the Pasadena Pops Orchestra include his Variation on a Theme by Haydn and his Concerto for EVI (Electronic Valve Instrument) and Orchestra. The Fanfare for a Soccer Championship was premiered during the celebrations of the 1994 World Cup of soccer, held in Los Angeles. Casita de Miel, a jazz composition for solo Flute and Orchestra, was also premiered that year. Other works recently premiered are: Suite "El Tonto De Las Adivinanzas" for Orchestra, premiered by the Redlands Symphony, as well as the cantata: "Eyes of Great Heart" commissioned by the University of Redlands. Children's Variations for Woodwind Quintet and String Bass and the Trio for Soprano Sax, Bassoon and Piano, a commissioned work by the University of Arizona, premiered during the 1998 International Double Reed Society convention in Phoenix, Arizona. As an oboist, Francisco was a prize winner at the 34th Chamber Music Competition in Colmar, France, with the USC Graduate Woodwind Quintet and also won the first William Criss Memorial Award at USC in 1985. Francisco is principal oboist with the Redlands Symphony, California Philharmonic Orchestra, and the Pasadena Pops Orchestra. Mr. Castillo has performed with many different orchestras including the San Diego Symphony, San Diego Opera, Los Angeles Philharmonic, New West Symphony Orchestra, Pacific Symphony, Long Beach Symphony, Riverside Philharmonic, Burbank Symphony Orchestra, San Bernardino Orchestra and the Santa Barbara Symphony Orchestra. Mr. Castillo also works and records for the movie industry and shows, and has performed on CDs with many different artists. Most recently Francisco recorded the Concerto for Oboe and Orchestra by Charles Fernandez with the Royal Philharmonic Orchestra in London, England under the direction of the composer. Mr. Castillo's principal oboe teachers were William Criss, David Weiss, Alan Vogel, David Busch, Claudio Bondi, Hernan Masis and Barbara Northcutt. Mr. Castillo's principal composition teachers were Benjamin Gutierrez, Carlos E. Vargas, Daniel Kesnner and Alberto Ginastera. Mr. Castillo's principal conducting teachers have included Benjamin Gutierrez, Larry Christensen and Hans Bear. 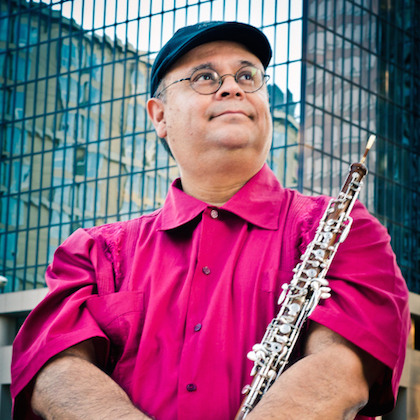 Mr. Castillo is also the oboe and chamber music instructor at Redlands University, Pasadena City College, Pomona College, the Idyllwild Arts Academy and the Los Angeles County High School for the Arts. He has been recognized as an outstanding oboe teacher and chamber music clinician. Many of his students have won major solo and chamber music competitions in the United States, and his students have also been admitted to the best Universities and Music Schools in the United States.